I found Christopher Kanes collection quite inspiring for this summer-it was fun to see faded denim back in fashion again-I purposely thrifted my River Island faded denim cropped jacket and my Diesel faded denim skirt to fit in this current trend! 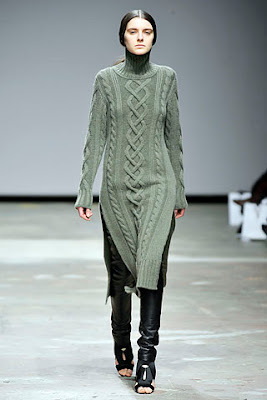 I thought I would check out his fall collection and although I don't intend on buying winter clothes just yet (! ), it has inspired me with some thoughts of what I could thrift if similiar items are to be had- I particularly love the jumper dress, the sequinned cardi with the LBD and the sleeveless coat over the chiffon dress- I think these trends can be obtainable through the high street (maybe not just yet) and by thrifting!! So although many of us are thinking summer, if you do go thrifting keep your eyes peeled for any winter items that can translate these trends, if you love them like me!! I like that last look a lot! Enjoy your weekend, Sharon, my dear! OMG I love the mix between thrift and designer! I have been trying to get my friends into it but they wont budge. check out my blog. I'm doing a fashion sprend sometime next week. Leave a comment! Sharon - good post. I will have to keep my eyes out while I'm shopping. Because, I just passed over a sequin jacket similar to the one in picture #3. Also, Thanks for the add! ohh i love the 1st and 4th look from the fall collection! I'm currently sand papering some jeans cut into shorts in hopes of this Christopher Kane look. But I think I'm giving up, so much work! Hi fashionpuppy-yes, I see your point, especially when there are so many summer bright colours around!! Hi wendy-I agree, this is a fabulous outfit!! Hi atelier-Yes me too, so inspirational!! Hi ida-yes, I understand what you mean-its hard to get excited about winter trends with all summers lovely bright colours about!! Have a lovely weekend! Hi secretista-yes, you can cosy up in winter!! Hi beachybabe-thanks so much for your comment and stopping by my blog-I will definitely pay you a visit!! Hi boroughvintage-thanks so much-shame about the jacket you missed!! Hi owner of this space-Thanks so much!! 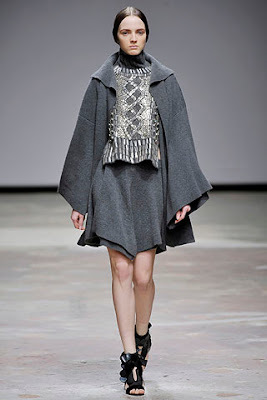 I agree, this collection is very inspiring-you can adapt it to your own personal tastes! Hi taghrid-Yes, I agree, they're lovely! Hi wendy-I'm sure they will look stunning anyway!! Hi danz-Yes I agree, I don't need one, but if one came along...ha ha!! Have a lovely weekend too, Danz! Hi ontrack-yes, I so agree-I love all of these!! Hi juliam-yes-they are gorgeous, especially under woollen items, so stylish. Great inspitaion Sharon! Love the greys, and I am always looking with a open heart for anyhting as I thrift, thats the best way I think! Hi Silje-thanks so much! yes, you're totally right-you have to keep an open mind when thrifting! Hi marte-yes its a real stylish outfit! !